Hello 2019! The new year is upon us! I am happy to write about a small new coffee shop that is sure to bring extraordinary eats and drinks to many this new year. Offset Coffee opened up in Torrance, California just this December 27, 2018. 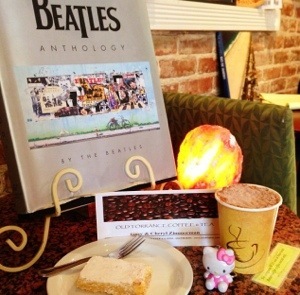 The owners are two locals who simply love coffee. They wanted to share their love of coffee via opening up the only multi-roaster coffee shop in the South Bay. Walking in, I instantly became a fan of the small and simple cafe. It definitely sets an “offset” type of mood from the hustle and bustle of a busy life. Very simple. Very basic. It’s all about taking a breather and simply enjoying the coffee here. Their menu consists of various coffee delights ranging from drip coffee to cortado and flavored lattes. Flavored lattes are vanilla, hazelnut and lavender. They also offer cold brews, Mexican cokes and hot chocolate. Upon my visit here, my mom and I tried the hazelnut latte and cappuccino, respectively. 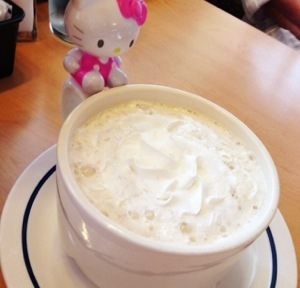 The hazelnut latte was simply delightful. It had the right hint of hazelnut flavor in the cup. It was nutty, sweet and creamy and a perfect match to the pastries we would also try on this visit. The cappuccino was also great. A perfect starter for the day with it’s rich and bold flavor. 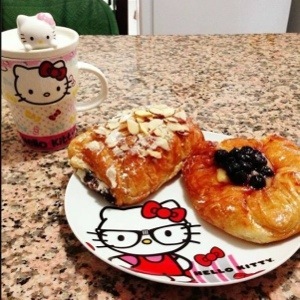 To go along with are cups of coffee, we tried two of their fresh baked pastries. Offset’s pastries are from Bakers Kneaded. Bakers Kneaded bakes daily in Los Angeles organic whole grain breads and pastries from California sourced and grown ingredients. First up we tried the bombolini. Talk about heaven in a bite. These Italian doughnuts are filled with custard that simply melts in the mouth. It is no wonder these sell out almost daily at the shop. The next pastry we tried was their almond croissants. The almond croissants have a buttery, flaky crust topped with powdered sugar and almonds. Inside is a lovely almond paste that is simply perfection. Trying out Offset Coffee was great way or shall I say an extraordinary way to start the new year. I cannot wait to have more “offset” days. I’ve always liked the above quote from Kate Spade and walking into the newly opened Grimaldi’s reminded me of this quote. 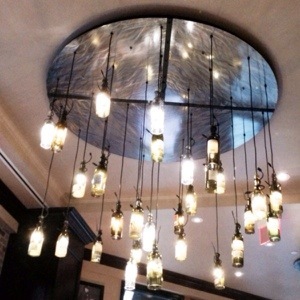 One of the first things I first noticed was the cool looking wine bottle chandeliers on the ceiling. 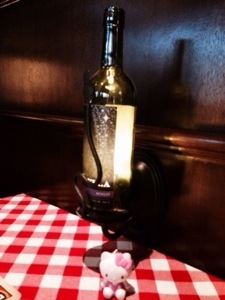 The next thing I noticed where the red and white checkered tablecloths and the wine bottle candles on all of the tables. The whole restaurant has a very New York-ish feel that gives diners a feel that they just stepped into a simple yet sophistscated NYC pizzaeria. (Simple yet sophisticated like the Kate Spade quote from the start of this post ;). 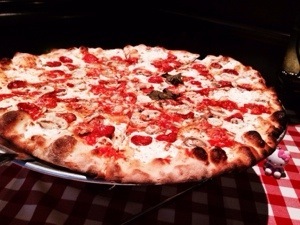 The New York-ish feel is very much appropriate because Grimaldi’s originated from NYC. 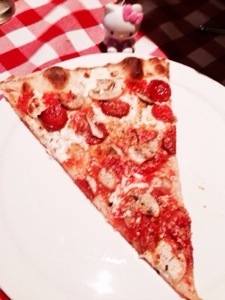 My taste of New York started with a personalized pizza that I split with a friend. Straight from the coal fired brick oven, we were presented with a nice pizza topped with their famous Grimaldi’s sauce, fresh mozzarella, pepperoni and mushrooms. It was all on top of a thin, crispy crust. 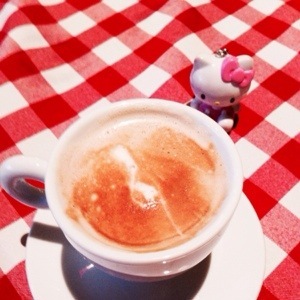 To go along with my pizza, I got a latte.They offer illy coffee here. Illy is famous for specializing in espressos and I was very happy with my latte that had rich espresso topped with steamed milk and foam. It was my little cup of happiness. For dessert, my friend and I got the dessert trio and chose to get one of each of their popular desserts. 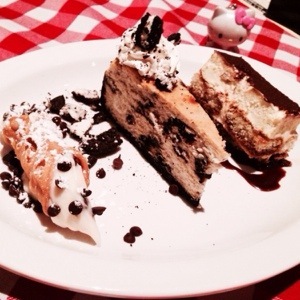 Our choices were Grimaldi’s famous cannoli, oreo cookie cheesecake and tiramisu. The cannoli here is famous for a reason. A nice crisp shell, sweet cream filling with chocolate chips made for one good classic Sicilian pastry. The oreo cookie cheesecake was housemade and had a good oreo cookie crust as well as plenty of oreo mixed in the cheesecake. The tiramisu had distinct coffee flavor and very soft, sponge like layers. 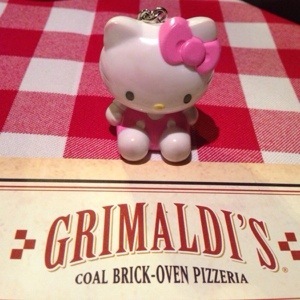 For more smiles, please see my recent Yelp review on Grimaldi’s. Hello Jackson’s Food and Drink Tasting Dinner! Things I love: good food, good people and happy smiley moments :)…Thanks to Jackson’s Food and Drink in El Segundo, all those things I love came together last night. 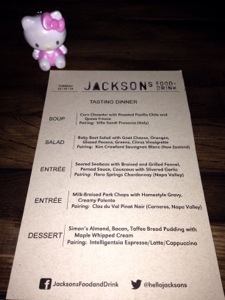 I was chosen to be one of the lucky to attend a special tasting dinner last night at Jackson’s Food and Drink. Chef Scott Cooper created a tasting menu with some of his newest dishes. Each dish was paired with a glass of wine that Chef Scott personally picked to complement his dishes. 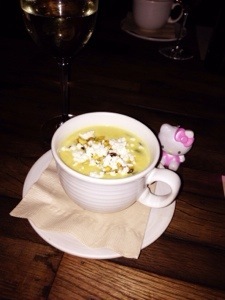 The first course of the night was a corn chowder soup with roasted pastille chile and queso fresco. It was paired with Villa Sandi Prosecco from Italy. The corn chowder was very thick and creamy with lots of little pieces of corn for a little bit of sweet and chile for spice. This soup actually had more of a spicy kick to it. The queso fresco on top helped balance the flavor more. The Villa Sandi Prosecco was my favorite wine pairing of the night. It was light, slightly fruity with a touch of apple flavor. 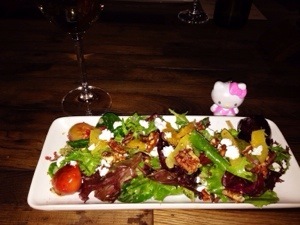 The second course of the night consisted of a baby beet salad with greens, goat cheese, mandarin oranges and glazed pecans. The dressing was a citrus vinaigrette. There was also a little bit of rice wine vinegar added in to enhance the citrus flavor. This salad was the favorite of many that night. Juicy, large red beets, sweet mandarin oranges, crunchy pecans and soft goat cheese made for a very flavorful, colorful salad. This salad was paired with Kim Crawford Sauvignon Blanc from New Zealand. The third course was a surprise course! We were originally going to have only five courses that night but Chef Scott came out with a new soup that he said we must try! I’m so glad he decided to do this because this course was one of my favorites. It was a tomato soup made out of chicken stock. It was garnished with sour cream and croutons. 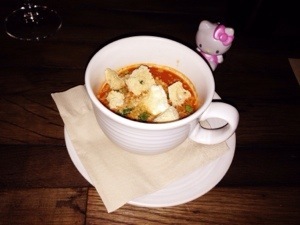 I’ve always been a fan of tomato soup and this one was one of the best I’ve had. It had a rich, marinara like flavor. It was so nice and heartwarming, making it perfect for a slightly chilly night. After the soups and salad were the main entrees. First up was the seafood entree consisting of seared sea bass with braised and grilled fennel, Pernod sauce and couscous with silvered garlic. As some may know, I do not like seafood and when this first dish came out, I could instantly smell the strong fishy flavor (eek). I was brave though and tried just a little bit of the Mexican white sea bass. From my very teeny tiny bite of the sea bass, I found the fish to be slightly hard. My non-seafood loving self moved on to eating the couscous and the fennel. I liked the crunchy fennel as well as the light, fluffy couscous. 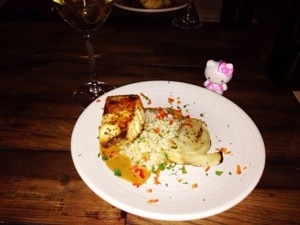 I was actually happy to have a little bit of the wine pairing, a Flora Springs Chardonnay from Napa Valley to help offset the strong fish flavor that this dish had. The next main entree was milk braised pork chops with homestyle gravy and creamy polenta. It was paired with Clos du Val Pinot Noir from Carneros, Napa Valley. Chef Scott told us for this dish pork shoulder was braised for three hours and one could instantly tell at first bite because the pork chops were so tender. I also loves the fried sage that garnished the pork chops. These pork chops went very well with the creamy polenta. 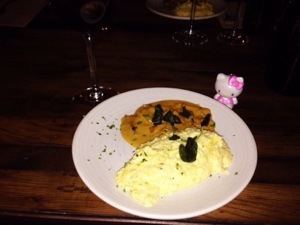 I really liked the creamy, fluffy and very savory polenta. The Clos du Val Pinot Noir was the only red served that night. Last course or the night was a very amazing and intense dessert. 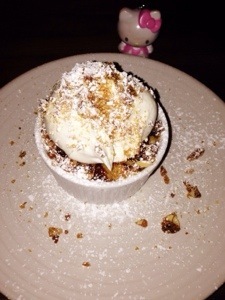 It was Simon’s almond, bacon, toffee bread pudding with maple whipped cream. Simon is one of the chefs at Jackson’s and this dessert is one of his most special. It’s very unique. Lots of maple whipped cream topped a soft bread pudding. There were also plenty of crunchy almond, bacon and toffee. How appropriate the dessert had a little bit of bacon because my Hello Kitty twin Michelle was also in attendance at this dinner. Michelle is not only my hello kitty twin but also my fellow dessert fan/bacon buddy. Michelle and I have always bonded over dessert and foodie discoveries and this dessert both made us go ooh and ahh. Honestly I could not get through all if it. It was very good but also very sweet. Although the bacon made it unique, I think I could have gone with just bread pudding and a little bit of toffee. The yummy dessert needed some hot beverages to offset all the sweetness and so it was perfect that Jackson’s offered us Intelligentsia cappuccinos and lattes. 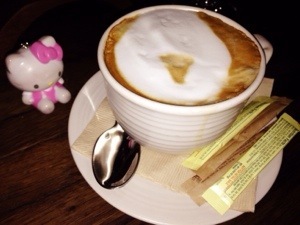 The cappuccino was beautifully presented. Tastewise, it had a slightly strong bold flavor. I preferred the latte! Simple, rich, tasty flavor, it made for a great ending to this six course dinner. 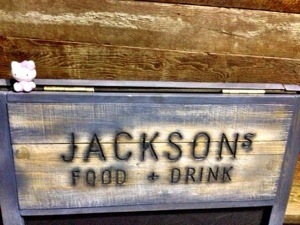 I really enjoyed the tasting dinner at Jackson’s Food and Drink. 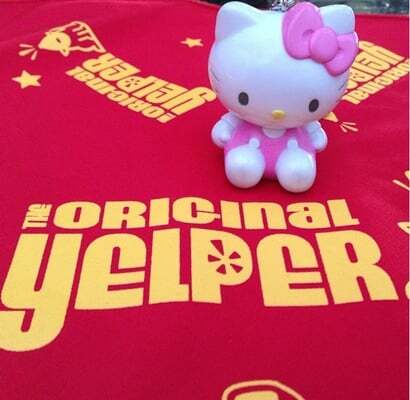 I got to enjoy some tasty new dishes as well as converse with some other foodies. It was a night of many happy smiley moments :). Thank you so much Jackson’s Food and Drink for inviting me and letting me be one of the first to try some of your new dishes! For more smiles, please read my recent Yelp review about the tasting dinner at Jacksons’s Food and Drink. 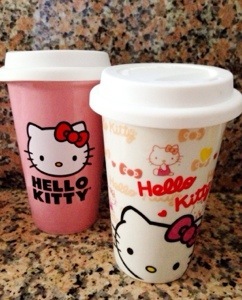 Coffee, tea or hello kitty? Happy national coffee day everyone! One coffee for me and another for you ;). I simply love waking up to the sweet aroma of coffee in the morning. Sitting down and enjoying my sweet cup of cappuccino along with pastries from the local farmers market on weekends is one of the times during the week that I love the most. 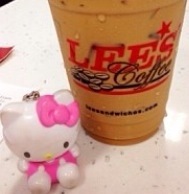 I actually am a fan of coffee anytime and anywhere! Coffee time and hanging out with family and friends is the best! It’s such a warm, comforting feeling sitting down with a pumpkin latte or cupcake flavored coffee. I love starting the mornings with a freshly brewed cup or ending the day curled up with a book in one hand and a cappuccino in the other. There is a perfect coffee for every occasion. 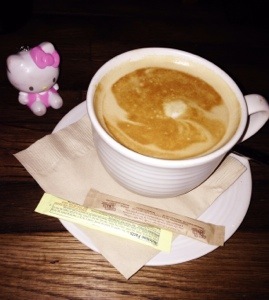 To end this blog post, I wanted to “espresso” myself and wish all my readers all a whole “latte” love! Thanks for being sweet and reading this post. You all are like the cream to my coffee and you make writing such a cool beans experience :). Have brew”-tiful day and take time to smell the coffee!